CIF Surveys: Don’t Leave it Too Late! The deadline for submitting an application for this year’s round of Condition Improvement Fund (CIF) funding is 13th December 2018. Only four weeks away! Once the tenders are in, the surveyor has to evaluate the tenders, put the application together and help you submit, all before the deadline. Firstly your surveyor needs time to assess the roofs correctly and put together an accurate set of recommendations, phased if necessary, with a specification for the works for which the application will be made. We normally approach at least three and up to five contractors to price the work; this gives you evidence of good value in the pricing. One of the key CIF criteria is value for money, so it’s important that your application can demonstrate value for money. Contractors will be under pressure to price the work as we near the deadline, and though all our DATAC accredited contractors are professionals, shortness of time increases the risk of mistakes being made in their pricing. Contractors may also refuse to price, which can make it difficult for us to get a reliable, competitive price for the work. We pride ourselves on helping schools avoid any additional costs when the work is underway, which is why it is essential to have a detailed scope of works, properly costed. More time to do a report also gives your surveyor time to assess the roofs correctly, evaluate the tenders correctly and word the application properly, making sure that your application will be robust and more likely to succeed. As we are all well aware, the CIF fund is oversubscribed, and weaker bids will be much less likely to be looked at. Hence our amusing video at the start. It’s the classic argument. Cutting time means cutting costs in the short term, but increasing costs, and ultimately disappointment, in the long term. In 2017 we were asked by a Primary School to survey their roof three weeks before deadline day. The school had leaks over the dining hall, and a tarpaulin on the roof was keeping it reasonably watertight – not an ideal situation! Not only were the leaks making the school damp and dangerous for pupils and staff, the soaked insulation was making the whole school colder and wasting heating energy. Unfortunately three weeks wasn’t really long enough to make a robust bid for CIF funding. Unable to get correct photography and budgetary information in on time, we failed to make the bid. But all was not lost. By planning ahead we’ve been able to gather plenty of information and evidence of the effect of the leaking roof. Our bid for funding for this school, which has gone in already (of course), is very likely to succeed. 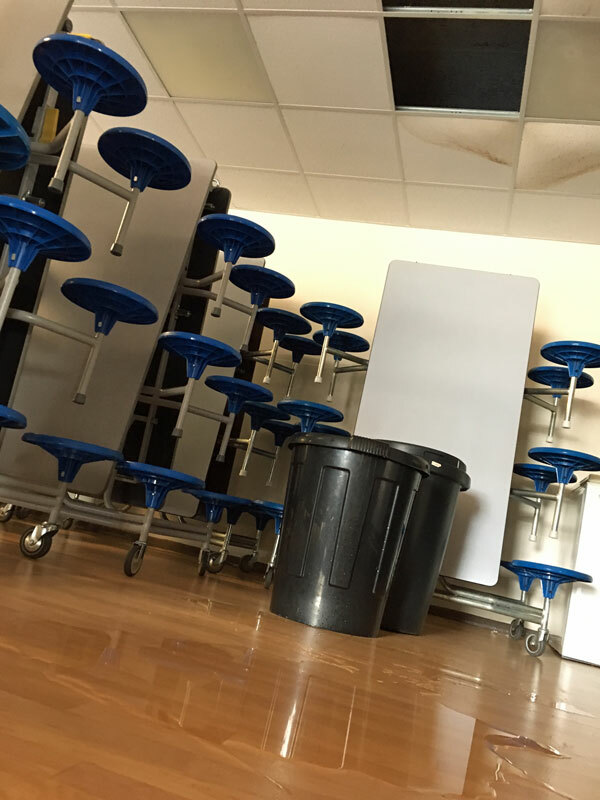 By taking the time to put a funding bid together properly and with expert advice, the school’s bid does justice to the struggles of the school to cope with the predicament that the leaking roof has left them in. So if you’ve got a leaking school roof, why not plan now for next year’s round of funding? There is no obligation to put in a bid, but we can start doing your free surveys now and make recommendations in plenty of time to do the job properly. Get in touch early, use the professionals, and make your bid for CIF Funding of your leaking school roof count.